Several UK cities are looking to implement smart projects and developments to improve the efficiency of local services, enhance sustainability and develop their competitiveness. Operating hybrid and electric bus fleets is one initiative designed to improve the ‘livability’ of a city, helping to attract business and talent to support economic and business growth. As our cities grow and the pressure on transport networks increases, it is anticipated that the demand for low emission solutions will intensify. New energy-efficient technology for buses has the potential to make an important contribution to meeting air quality targets. According to the European Commission, road traffic is responsible for around 40% of emissions of nitrogen oxides in the EU. Furthermore, around four fifths of nitrogen oxides that come from traffic emanate from diesel-powered vehicles. In London, for example, while the city will comply with the 2020 requirements of the ultra-low emission zone (ULEZ) for buses in Central London a year early, considerable work is still needed to improve the air quality of the city. On Brixton Road, for example, more than 20 hourly readings showing concentrations of toxic nitrogen dioxide (NO2) that exceeded 200 micrograms per cubic metre were recorded within the first week of 2017. Currently, under European law, citizens should not be exposed to such high levels of NO2 more than 18 times in a year. Electric vehicles produce no pollutants at street level and up to 40% less CO2 emissions as a whole compared to similar-sized petrol or diesel vehicles. Upgrading bus fleets therefore has the potential to greatly impact a city’s air quality. Edinburgh City Council has recently been working on a range of projects to encourage sustainable transport that are already showing promising results. Alongside traffic management and parking systems, the city introduced 65 hybrid buses on a number of routes in December 2014. In 2016, positive statistics from monitoring stations at key locations in the city showed a marked improvement in air quality compared to 2015 with 97% of streets meeting required standards. 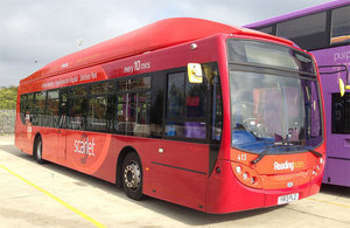 Local authorities are therefore looking to other forms of finance to help them invest in new equipment including technology to enable the implementation low emission bus fleets. The reality is that cities need to access a blend of public and private sector finance to accelerate their smart initiatives in a timely way and benefit from the resulting savings, efficiency, quality and citizen service improvements as quickly as possible. A report from Siemens Financial Services, SmartStart, identifies a number of potential Smart City initiatives – including hybrid and electric bus fleets - that can be financed by using funds from the private sector and have the potential to generate savings that effectively pay for the investment. The report estimates that as much as £5.28bn could be available in funding from the private sector in the UK for these small-scale initiatives. Many of these projects effectively unlock more finance availability for cities from financiers that intimately understand how such smart city technology applications work and the benefits they produce. Tailored, all-encompassing financing packages tend to be offered by specialist financiers, such as Siemens Financial Services, who have an in-depth understanding of energy-efficient technology and its applications. Specialist finance providers understand the importance of implementing new equipment and new technology to generate revenue and cut operational expenses, and can therefore provide customised financing solutions that deliver energy savings and lower expenses, for instance, flexing the financing period to suit cash flow. This contrasts with the standard financing terms usually available from generalist financiers. Hybrid and electric bus fleets and other small-scale smart city developments can help reduce councils’ carbon emissions, help meet air quality targets and improve people’s health. The budget, however, has to be available and as public funding continues to be cut, many councils are recognising the important role that the specialist private financing can play to help them fulfil their ‘smart’ ambitions.